This page contains a number of short musical samples in MIDI and MP3 format. 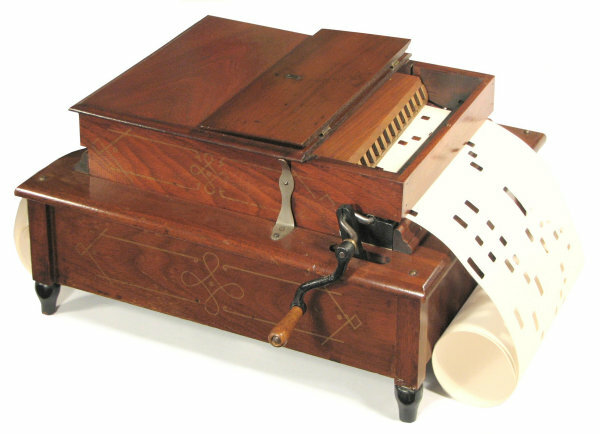 The tunes have been selected to give an idea of the capabilities of the instruments, and the styles of music that can be found on the original rolls. The MP3 files are only mono, and are quite heavily compressed. The instruments themselves sound rather better. These tunes have been scanned and re-mastered from original 14-note music sheets from the early 1880's. The arrangements can be very effective, in spite of the limitations of the 14-note scale. The actual sound you hear will depend on how well your computer plays the MIDI "Reed Organ" setting. Here are three short MIDI extracts which show several quite different styles of 20-note organette arrangements. These files were scanned and re-mastered from original Wilcox & White "Symphonia" rolls from the 1880s and 90s. Shall we meet beyond the river. (MIDI file, 2kb, 43 seconds). Grandfather's Clock. (MIDI file, 2kb, 40 seconds). Yankee Doodle. (MIDI file, 2kb, 20 seconds). Here are some audio extracts from new arrangements for the 20-note organette by Stephen Kent Goodman. The tunes have been played on the computer using the "Reed Organ" setting, then recorded and compressed into MP3 files. There are further details and descriptions of these (and other) tunes on the New Arrangements page. 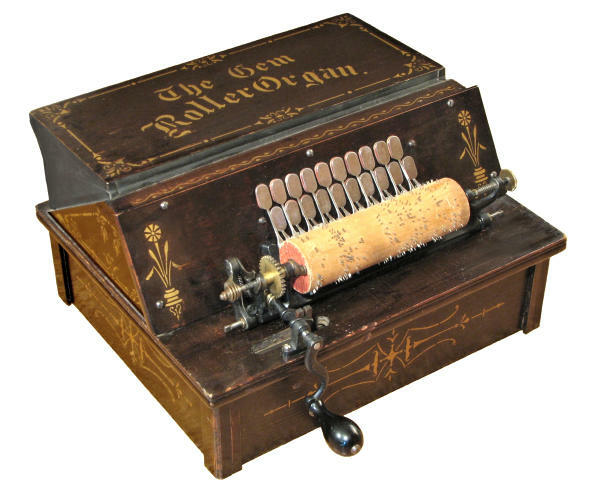 This tune is an audio recording from an original roller from the 1890s. This is the whole tune - the rollers only play for about 40 seconds. 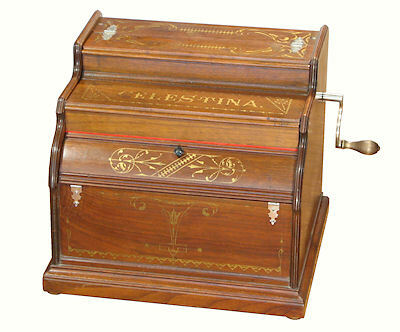 The recording was made from a Gem organ in fair unrestored condition, and compressed into an MP3 file. 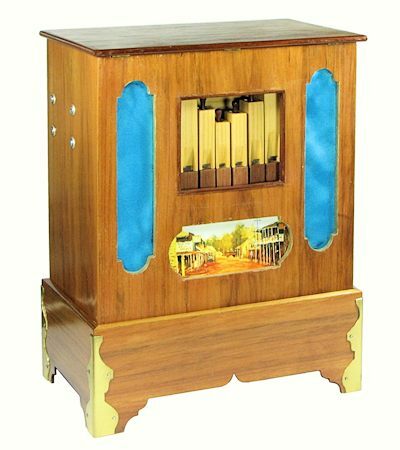 Here are three audio samples recorded from my home-built 14-note crank organ. Rock-a-bye baby. (MP3 file, 82kb, 33 seconds). A simple nursery tune, originally arranged for the 14-note organette back in 1996. Oh dem golden slippers. (MP3 file, 60kb, 24 seconds). A music-hall song from 1879, transcribed directly from an original 14-note tune sheet. Drinking song from La Traviata. (MP3 file, 104kb, 42 seconds). Adapted from an original roll for the 16-note Tanzbär automatic accordion. Original text, images, and sound files Copyright © John Wolff 2003-17.